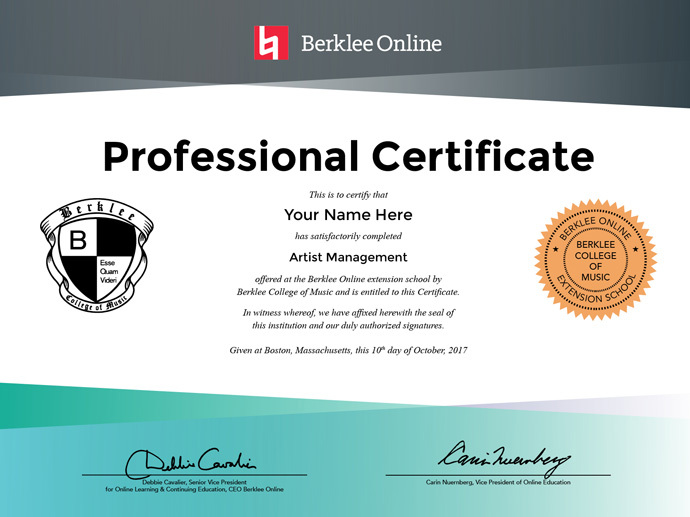 Whether you're a current artist manager looking to sharpen your skills, an aspiring artist manager, or a manager for yourself or your band, this program will cover all the key areas of the music business that require your thorough understanding, such as licensing, touring, finance, marketing, and music business trends and strategies. Learn successful tactics for merchandising, publicity, radio promotion, retail, distribution, social media, crowdfunding, video, advertising, and more in order to build the right strategic plan and business model for your band(s) or artist(s). Overview Course Requirements About this Certificate Enroll Now No application required. Gain a forward-thinking approach to the key issues that all musicians, music industry entrepreneurs, managers, and music business professionals face in the main segments of the music industry, and how to leverage the opportunities that the new music business provides. Learn the basics behind marketing and selling your music! Music Marketing 101 provides artists, managers, and business entrepreneurs with the foundational music marketing skill set they'll need to succeed and thrive in the new music business. Learn how to make money through creative licensing of your music! In this course, you'll discover how to create new avenues for placement of your own music, identify current opportunities for your copyrights, and how to use online resources to introduce your music to music supervisors, ad creatives, video game producers, and more. Learn the preparations and logistics involved in developing, budgeting, and executing a successful tour, from small club dates to international stadium shows. Explore the role and importance of an artist manager, what they do, and how it impacts the career of the artist and their brand.